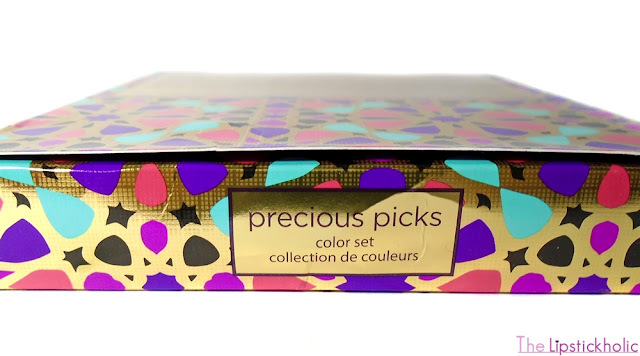 Review: Tarte Precious Picks Color Collection...!!! The set comes in a bright and funky cardboard box. 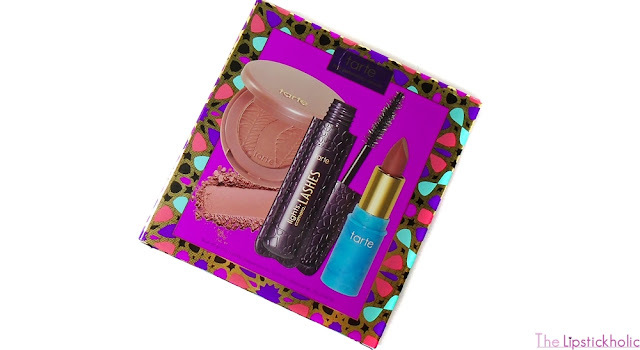 Inside the box there are three deluxe Tarte Cosmetics products including Tarte Amazonian Clay Powder Blush "Ornate", Tarte Color Splash Hydrating Lipstick "Surf's Up" and Tarte Lights, Camera, Lashes 4-in-1 Mascara. 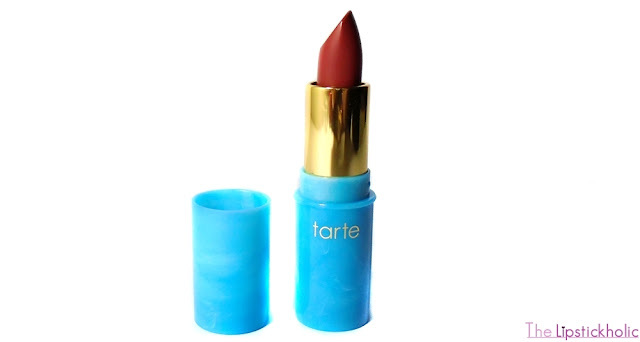 Tarte Color Splash Hydrating Lipstick "Surf's Up"
Starting with Tarte Color Splash Hydrating Lipstick "Surf's Up", this mini-sized lipstick has surely got my heart. It is very pigmented, glides on the lips easily and feels very comfortable on the lips. It's formula is hydrating yet it does not look glossy and provides a semi-matte sort of finish. This lipstick just comfortably sticks to the lips and stays for many hours, even lasts through meals. The shade Surf's Up is a rosy brown shade. The shade is slightly darker for my liking. I like to apply it on the lips, blot it and the shade looks perfect then. Overall, this lipstick surely makes me want to get more shades from Tarte Color Splash lipstick range. 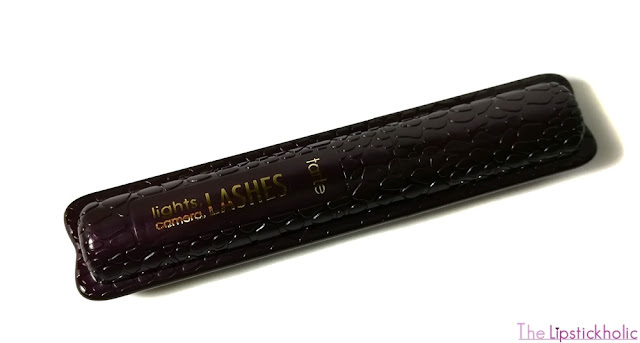 Then we have the Tarte Lights, Camera, Lashes 4-in-1 Mascara deluxe in this set. I love how the mascara defines and lengthens the lashes. It even curls the lashes and holds the curls well. However, this mascara does not add a lot of volume to lashes so if you are looking for a volumizing mascara, then this one is not for you. Also, this mascara is not water-proof. 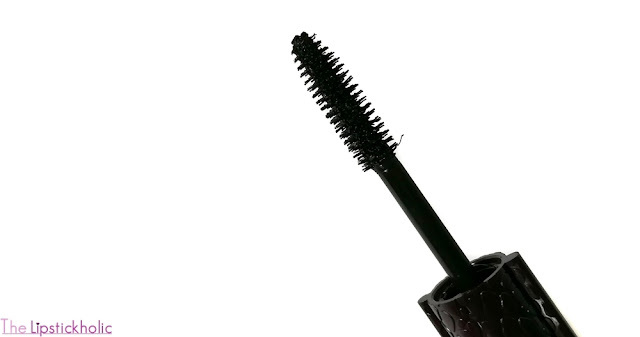 Nonetheless, this mascara is great for everyday use and defines, lengthens and lifts the lashes nicely. Tarte Amazonian Clay Powder Blush "Ornate"
I am a huge fan of Tarte blushers already and absolutely love Tarte Amazonian Clay Powder Blush "Ornate" included in this set. The blush has a really nice, easy-to-blend formula. 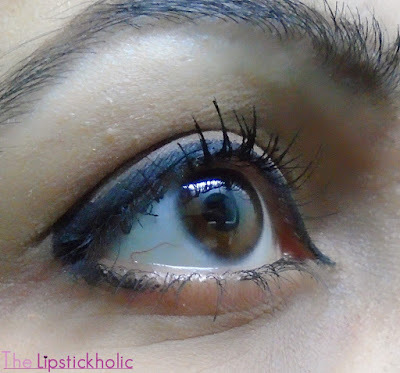 It is fairly pigmented and offers a soft satiny matte finish. 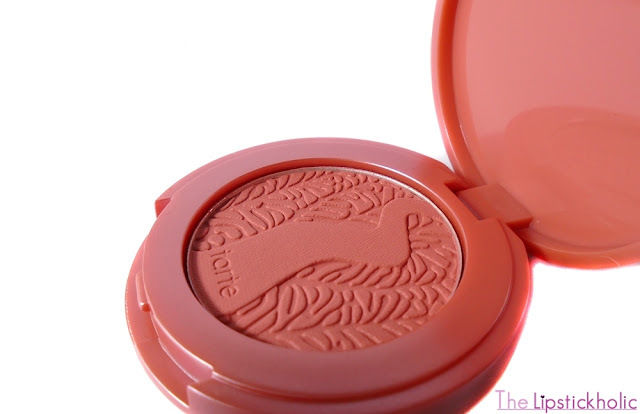 Overall, Tarte has once again impressed me with this blusher. Left: Tarte Amazonian Clay Powder Blush "Ornate" Right: Tarte Color Splash Hydrating Lipstick "Surf's Up"
All in all, Tarte Precious Picks Color Collection is a great set containing three deluxe best-sellers by the brand. 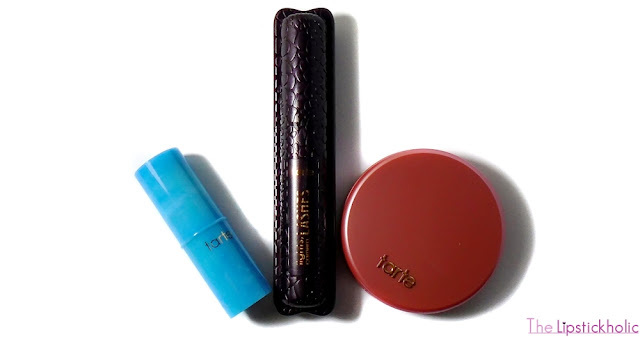 The set is great for those who want to try out 3 of the most popular products by Tarte Cosmetics before investing into full-sized products. 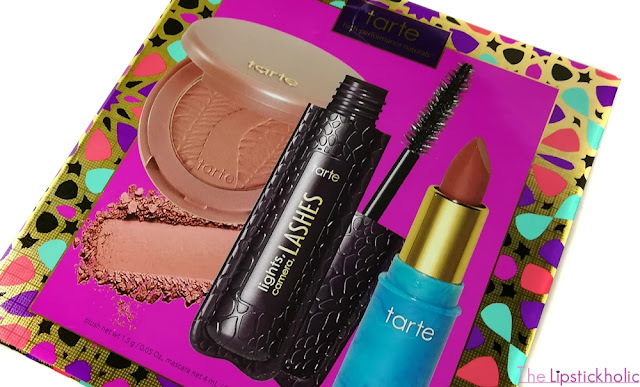 I absolutely love the blusher and lipstick included in this set and I am now intrigued to try more shades from Tarte Color Splash Hydrating Lipstick range. 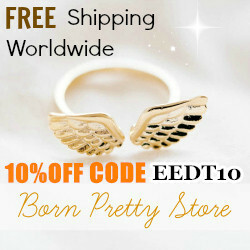 Furthermore, all the products in the set are vegan & dermatologist tested. The set is surely great for the price and I absolutely love it. Price & Availability: Tarte Precious Picks Color Collection is available online at Tarte Cosmetics Website for $10 (Rs 1400) only. Totally agree with you. Mini Sets are actually good value for money. This set is perfect, loved the shades of blush and lipstick. I just saw this kit on Sephora and it looks amazing. Definitely worth the price. It sure is. Thanks for stopping by dear. A Business Graduate and a Beauty, Fashion and Lifestyle Blogger. Love makeup and photography and words inspire me much. 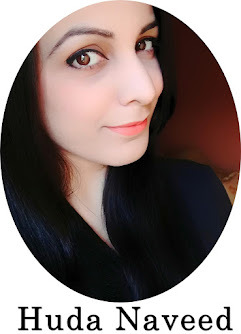 Review: Revlon Colorburst Lip Butter in "Tutti Frutti"
Review: Hemani Herbal Whitening Cream & Other Skin Care Products...!!! 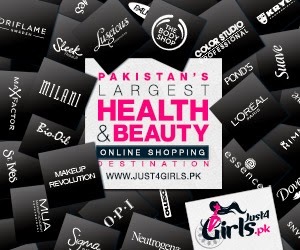 Press Release: Shiza Hassan Exhibits Her Debut Lawn Collection...!!! The Lipstickholic. Powered by Blogger.